Welcome to the N3OX (formerly N3UMH) Radio Pages. I'm off air for now. I've moved to Brooklyn, NY for a new job, and I'm not planning on setting up a station for a while. Probably reboot as a QRPer when I do, and implement some of the short antenna ideas I've worked on over the years in an apartment setting again. Added the remote tuning switch to my short antenna. It's connected to the main tuning rope with a slack cord. As you pull the main tuning rope the antenna tunes across the 40m band and then somewhere up around 7400kHz, the extra slack is gone, the LEGO/Powerpole switch closes and the tuning jumps to the 30m band. I was able to choose a coil tap for reasonably low SWR on 30m with a "hat collapse" setting pretty far above 40m. Hopefully the 30m tuning will be stable in other weather conditions, because there's not really any remote adjustment possible from the shack. If the tuning isn't stable it would be easy to switch to a two-rope system where one rope is just a band switch and the other can be used to adjust the fine tuning. 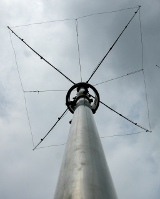 But I think the 30m tuning should be broad enough so that there aren't any problems. The switch seems to handle the somewhat high voltage present with 600W applied on 40m. Here's a video on YouTube of the switch in operation on the actual antenna. Doing some work on somewhat high voltage remote mechanical switches for coil tap changing on the Flex Vertical. The goal is to actuate the switch just by pulling a rope. This is a recent contender for the job. Anderson Powerpoles are pretty Lego-compatible if the interlocking nubs on the Powerpoles are filed down. I'm not totally set on a mechanical band switch for this. I might just get a vacuum relay. This is a little bulky. And at the moment it's just a SPST switch, so can only be used to short-circuit part of the coil for a higher band use; I will have to determine if that is acceptable. I think it will probably be fine with shorted turns on 30m, but I may test that on the bench first. But I'll probably find a use for this at some point anyway. A while back I put together a cool ratchet mechanism which can drive a rotary wafer switch from a reciprocating motion. But it didn't get as far along; it needs a pretty heavy spring return to actually get the index ratchet to turn a switch wafer via a pull rope. The index ratchet mechanism is sound and has the interesting possibility of single rope control... when you pull the rope, the cap hat collapses, raising the resonant frequency. If you pull it far enough, though a knot in the rope could engage with the ratchet mechanism and click the band switch to the next band. But I'm pretty sure that an adequate ratchet mechanism will need to be a machine shop job. The Lego contraption to plug some Powerpoles together seems to be robust enough for actual use. I'm kicking off a new section of my site which will collect some experimental and theoretical articles that aren't so directly tied to a particular constuction project. So I'm inaugurating the technical topics section with some experiments on coil Q that were inspired by the wet testing of my flex vertical. 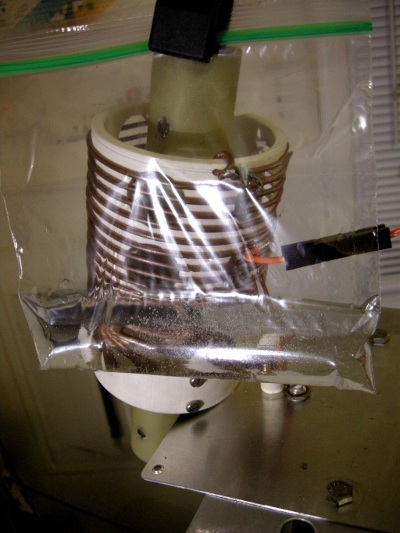 I used one of the methods from VE2AZX's Jan/Feb 2012 QEX article to measure an identical coil to the one that's installed in my vertical in the presence of water applied several different ways. While I had the coil Q measurement system set up, I measured a bunch of other coils and also the RF resistance of some ground braid . The results of those tests are at http://www.n3ox.net/tech/coilQ. Both of those are over "Real/High Accuracy" Sommerfeld-Norton ground with σ = 0.005S/m and ε=13, though that doesn't matter too much for horizontally polarized antennas. These are "elevation patterns" like the vertical antenna patterns below. In this case the elements are sticking in and out of the screen. I've added a little far field elevation pattern from EZNEC in the caption of each of the animations for reference. You can see the front to back and the different lobes of outgoing radiation, especially for the five element antenna up high. I chose much wider views for these animations to show the patterns in the outgoing waves rather than focusing tightly on the reactive near field. I was working on some visualizations and made this animation of the oscillating azimuthal magnetic field Hφ for the new short vertical antenna. Animated 7MHz magnetic field for the new vertical out to 80ft. 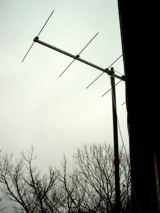 from the antenna and 30ft. high. EZNEC v. 5.0+ was used to calculate the complex amplitude (amplitude and phase) for the magnetic field in six inch steps from near zero to eighty feet horizontally and near zero to thirty feet vertically. The antenna is in the lower left, centered on the edge of the plot; you can see one of the sloping sides of the pyramid capacitance hat. The near field data was exported and GNU Octave was used to calculate the field as a function of time by multiplying the complex amplitude by e-jωt (0≤q;ωt≤q;2π), taking the real part, and plotting. The color scale here is nonlinearly compressed like C = sign(Hφ) * |Hφ|1/5 to give more visual detail. Thanks to Karol Krizka for good information about how to do the plotting efficiently. The series of .png files created using Octave was titled, cropped, and converted to animated .gif using virtualdub. I find this sort of field animation to be instructive. You can see the reactive near field contributions that are basically bound to the antenna structure, and you can see how they transition into radiation leaving the antenna a bit further away. I also plotted the vertical electric field Ez, and a wider view of a quarter wavelength vertical. 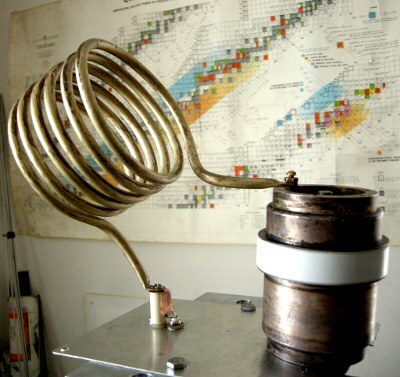 I'll eventually build a collection of animations like this for interesting antennas and I'll also work up an explicit tutorial on how to make these from EZNEC near field results. It's quick and easy once you get the hang of it. I just finished a big page on a three meter (10ft.) 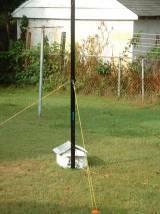 tall 40m, 30m, and 20m vertical with continuous, remotely controlled tuning using a flexible capacitance hat and rope. As three-meter objects go it's not quite as impressive as my three meter Ph.D. Experiment, but it's more practical for home build. 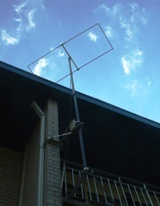 This article gives construction details but it is also a more general article about small antennas. In my opinion, too much energy is expended on making novel-looking things that are hard to understand and don't work very well. 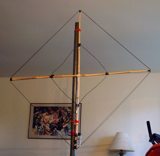 This article is intended to be a counterpoint to that and includes a lot of information on how I modeled and measured the characteristics of this compact HF antenna. 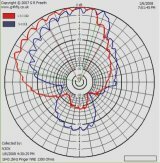 I characterized it thoroughly for the 40m band, and it should work even better on 20m and 30m. Yeah, so just like 94% of bloggish ventures, this bit goes a long time between updates. But I've got a new project up. Check out the Stepper Tuning Switch. At the moment, it works either in standalone mode or with Ham Radio Deluxe and the computer's parallel port to change bands on my sixty foot vertical. It would also support auto band-switching with DXLab Commander or any other program that will output a bit pattern on the parallel port based on the frequency read from the radio. Soon, I plan to modify it to support acquisition of frequency info over a USB serial connection with the help of N8LP's LP-StepLink software, removing the need for the parallel port at all. I've held an amateur license since February, 1995, and upgraded to Amateur Extra in 1999. I got the vanity call N3OX in January, 2006. I've been more or less active the whole time I've been a ham. I've been somewhat more active lately now that I'm out of apartment status and into a house where I am permitted some antennas, but I'm leaving all the apartment-specific information up for the cliff-dwellers out there. I recently finished my Ph.D. in Physics and am working as a post-doctoral researcher at University of Maryland, College Park. Thanks for visiting, hope you find the pages useful and interesting.